The PL-2000 offers a new approach in high power, low frequency location. With 3 active frequencies, 0.5kHz, 8kHz, and 27kHz and 2 passive frequencies, 50/60Hz, as a live cable detection mode and both inductive and direct connection capabilities, the PL-2000 is powerful and versatile. Can trace and locate any continuous metal such as iron, steel, copper water lines, gas lines, tracer wire by plastic pipe, telephone/TV cables, copper and aluminum wire, conduit and power lines. Max locating depth is 5 metres. The transmitter operates on 6 D cell batteries, and the receiver on 6 AA batteries. Package includes a padded carry case, transmitter, receiver, manual and conductive clips. The PL-2000 can also locate a live power cable without the transmitter using passive 50 or 60Hz modes. 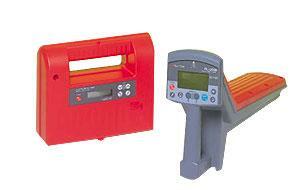 Accurate depth measurement of the located pipe or utility is at a push of a button.